I'm really excited for this bit of news I wanted to share with you. Today officially marks the one year anniversary of My Dear Darling! 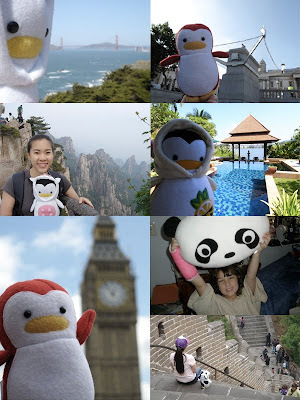 :D One year ago, I started with one penguin and a few awful photos. It took me a few months to prepare for that very moment. I read most, if not all, of Etsy's guidelines, subscribed and read every newsletter they sent out, read many relevant forum topics, took detailed notes while reading books on starting a business, you know, the standard research before jumping off. I wrote out a business plan, my husband and I came up with a name, created a branding identity and put a lot of hours and days into really scoping everything out. Then, I was ready. I was so excited, I let all my friends know about it and I could not sleep. Then it dawned on me, "Will anyone else like my stuff? Is this good enough? What if I never sell anything? What if, what if, what if...?" It was the biggest test to see if my vision of My Dear Darling was going to be approved by others or if it was going to go anywhere at all. Within the first two weeks of opening, I was lucky enough to receive my first sale! A personalized order at that! I was super ecstatic and quite nervous. I put my heart and soul into that penguin, making sure I crafted the best thing I've ever made in my entire life for my very first customer. (Thank you, T!) After shipping it off, I was glued to the computer, checking my Etsy views every few minutes. I soon realized that watching my shop 24 hours a day wasn't going to get me anywhere so I went back to crafting. I started making pouches and posted them in my shop. Yay, my second sale! Then to my third, fourth, all the way to today's 125 sales (on Etsy alone). I learned many many things along the way and soon found myself chatting with customers, taking personalized orders, making new products, joining the CCCOE & SF Etsy Street Teams, selling wholesale, creating an official website and becoming a regular at the Post Office. Every bit of this experience has been so wonderful, I'm very grateful for everything! I know I'm not a top seller or anything, but I have to say I'm proud of where I am and how far I've come along. :) I couldn't have gotten here without everyone's support, so thank you all! Now, I'd like to take a moment and do today's Gratitude Project, dedicated to YOU! your participation in contests & giveaways. your smily faces and lols. being able to work with you to create your personalized items. the way some of you take your plushies along with you on your trips! you listening to our silly podcasts. your excitement, which gets me even more excited about projects. the best clients and fans. Okay, I realize this is a long post today but I wanted to offer a little something to say thanks for a lovely year! 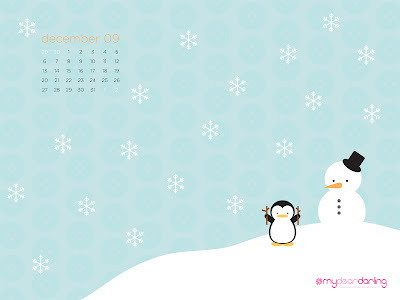 ;) It's somewhat useful and something everyone can use: a FREE desktop wallpaper calendar. You can download it by clicking on whichever screen size you'd like. I hope you enjoy it!